Spooky Boo tells scary stories for your listening pleasure. She writes tales to haunt you or finds stories of horror and ghosts on the internet or in creepypasta libraries. Welcome to the Midnight Monsters program where you can listen to true scary stories by listeners of the Spooky Boo Scary Story Time podcast and the Midnight Monsters program. I accept calls of all kinds including ghosts, haunted buildings, aliens, government conspiracy theories, shadow people, demons, possession, angels, seances, and ... See More more of the unknown. Midnight Monsters plays on Sunday nights from midnight to whenever the calls end. I will be telling some horror stories and talking about stories from the news. Listen to the terrifying horror stories written by Sarah Marshall McClanahan. SM McClanahan is also known as Spooky Boo. Come a little closer into the world of haunting horror and the world of scary stories with Spooky Boo. Submit your own stories at scarystorytime.com. Like the show? 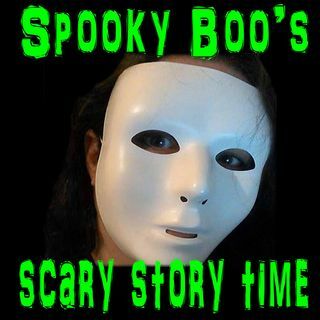 Help keep it running :) Support Spooky Boo at http://www.patreon.com/spookybooscarystorytime. Presentation (c) Spooky Boo. Stories told with permission by their respective ... See More owners. Music used with permission by the respective owners. Details in each episode.